Lost Paradise is the name of the 65,000 indoor waterpark located in the KeyLime Cove Resort across the street from Six Flags Great America and the Gurnee Mills outlet shopping mall just north of Chicago. The park features a lazy river, wave pool, and several body slides. 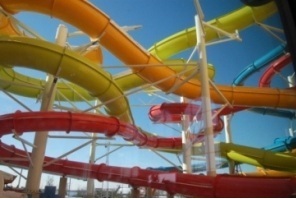 There's also a two-person tube slide with a swirling funnel bowl. There's also a whirlpool spa grotto for adults only and a Lil' Limers play pond for toddlers. Admission is generally reserved for overnight guests through groups can book birthday parties without staying at KeyLime Cove.